Folks, we need to put a drop in the bucket… and no, I’m not talking about water… we got plenty of that! During the storm, things got a little crazy (see Flickr) and there is water everywhere. It ain’t pretty. If at all possible, can you put a drop in the bucket? If you’ve ever attended a Web414 or a MilwaukeeDevHouse, it would be cool if you could chip in a few bucks to help our little clubhouse make it through this disaster. 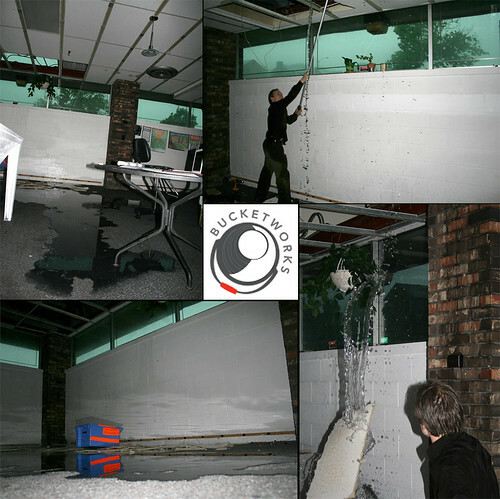 Bucketworks has been a gracious host to us, and it’s a time of need for them, so put a drop in the bucket and let’s hope it adds up enough to get everything back to normal. And seriously, go pitch in some money! So far it’s just Gabe and I that have done so, and that’s pretty sad. I know there are others out there who can help, even if it’s just $5 or $10.